In 2011, the Trump Organization signed an estimated $300 million deal with the Silk Road Group, a large, private Georgian investment company, to develop two Trump-branded towers in Georgia—one in Batumi and the other in Tbilisi. Eventually, the companies moved forward only with the Batumi project and decided to drop the Tbilisi tower. The project quickly stalled, however, after Saakashvili’s party lost the parliamentary elections in 2012. Saakashvili’s successor, Bidzina Ivanishvili, criticized the Trump-Silk Road deal and complained, “It was kind of like a trick. [The previous government] gave him money and they both played along, Saakashivli (sic) and Trump. And, as you know, Saakashvili was the master of lies. I don’t know what project this is, I’ve never been seriously interested. We won’t do anything based on such fairy tales.” At the time, the Trump Organization did not respond to reporters’ requests for comment on the deal. According to Bloomberg, “The Batumi tower was part of a broader Trump search for deals in the former Soviet Union.” Meanwhile, questions regarding Trump’s ties with Russia—ties that he denies—have continued to dog his presidency and triggered the resignation of his first national security adviser, retired Lt. Gen. Michael Flynn. The former head of the British intelligence service MI6, Sir Richard Dearlove, suggested that Trump may have become significantly dependent on Russian money in the wake of the 2008 financial crisis. 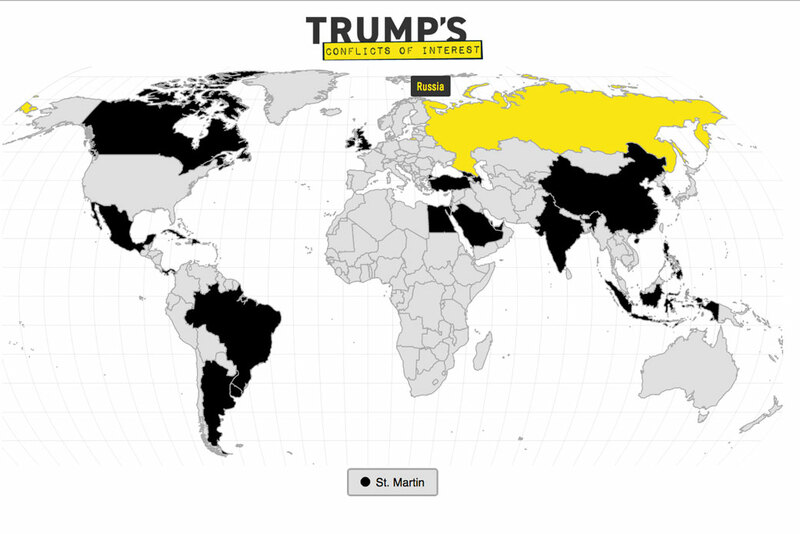 This interactive map of the world spells out President Donald Trump’s and his family’s conflicts of interest in 25 countries around the globe. In January, in another turnabout, the Trump Organization and the Silk Road Group issued a joint statement formally ending “the development of Trump Tower, Batumi.” The head of the Silk Road Group, Giorgi Ramishvili, commenting on the announcement, suggested that the conflicts in Georgia were so obvious that even the Trump team, which has largely disregarded conflicts of interest in other countries, felt it had to act. Trump Organization Chief Legal Officer Alan Garten, however, declined to comment on Ramishvili’s assertion that the project was cancelled due to conflicts of interest concerns. It is important to note that Trump’s business conflicts in Georgia are not the only ones that might influence his policy toward the country. Georgia is strategically important and is at a crossroads of oil and gas pipelines for much of Europe. 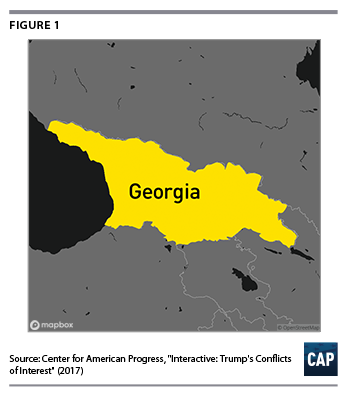 The regions of Abkhazia and South Ossetia, which make up 20 percent of Georgia’s territory, remain under military control of breakaway pro-Russia forces backed by Moscow, and Georgians and Americans alike should be concerned that Trump’s suspicious ties to Moscow might lead him to further encourage Russian expansionism in Georgia—at the clear expense of America’s interests. Read the full series of columns here.